Not to be confused with Aeneid. The Six Enneads, sometimes abbreviated to The Enneads or Enneads (Greek: Ἐννεάδες), is the collection of writings of Plotinus, edited and compiled by his student Porphyry (c. 270 AD). 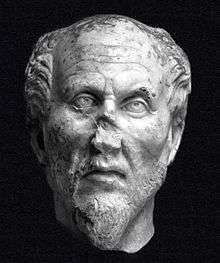 Plotinus was a student of Ammonius Saccas and they were founders of Neoplatonism. His work, through Augustine of Hippo, the Cappadocian Fathers, Pseudo-Dionysius the Areopagite and several subsequent Christian and Muslim thinkers, has greatly influenced Western and Near-Eastern thought. Since the publishing of a modern critical edition of the Greek text by P. Henry and H.-R. Schwyzer (Plotini Opera. 3 volumes. Paris-Bruxelles, 1951-1973) and the revised one (Plotini Opera. 3 volumes. Oxford: Clarendon Press, 1964-1984) there is an academic convention of quoting the Enneads by first mentioning the number of Ennead (usually in Romans from I to VI), the number of treatise within each Ennead (in arabics from 1 to 9), the number of chapter (in arabics also), and the line(s) in one of the mentioned editions. These numbers are divided by dots, by commas or blank spaces (there is no absolute consensus about this). It is important to remark that some translations or editions do not include the line numbers according to P. Henry and H.-R. Schwyzer’s edition. In addition to this, the chronological order of the treatises is numbered between brackets or parentheses, and given below. III, 5 , 9,8 since III.5 was the fiftieth written by Plotinus. HENRY, P. and SCHWYZER, H.-R. Plotini Opera. (Editio maior in 3 vols. including English translation of Plotiniana Arabica or The Theology of Aristotle) Bruxelles and Paris: Museum Lessianum, 1951-1973. HENRY, P. and SCHWYZER, H.-R. Plotini Opera. (Editio minor in 3 vols.) Oxford: Clarendon Press, 1964-1982. SLEEMAN, J.-H and POLLET, G. Lexikon Plotinianum. Leyden: Brill, 1980. ARMSTRONG, A.H. Plotinus. (7 vols. including Greek text of HENRY, P. and SCHWYZER a fronte) Cambridge: Harvard University Press, 1966-1988. ATKINSON, M. Plotinus' Ennead V.1: On the Three Principal Hypostases Oxford: OUP, 1983. BUSSANICH. J. The One and its Relation to Intellect (Translation and commentary of selected treatises). Leiden: Brill, 1988. FLEET, B. III.6 Oxford: Clarendon Press, 1995. Ἐννεάδες – The Henry and Schwyzer 1951 edition at Bibliotheca Augustiana. This article is issued from Wikipedia - version of the 12/1/2015. The text is available under the Creative Commons Attribution/Share Alike but additional terms may apply for the media files.